Once again a big thank you to our team of volunteer gardeners who last week transformed the raised bed in the Key Stage 1 Play Yard. As our photograph shows, it now has a mixture of herbs and other plants and it will be interesting to watch what develops in the pots. If you would like to join our team of volunteers please see Mrs Edmondson. 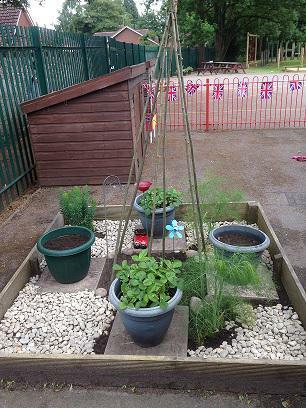 At the moment we are looking for volunteers to help with the planting of geraniums and other pot plants so please either speak to Mrs Rothera or Mrs Edmondson if you can help.